Don’t know what brought me here, possibly an article on Twitter point at the FT who were somewhat alarmed about the Balance of Payments deficit, which has been running as a deficit for a number of years. It was £38 billion representing about 4.4% of the nations GDP. The PSBR was £114.1 bn., total debt £1,772 bn. which was 86% of GDP. The continued and historical high deficit should reflect in a higher ratio of foreign owned UK debt. 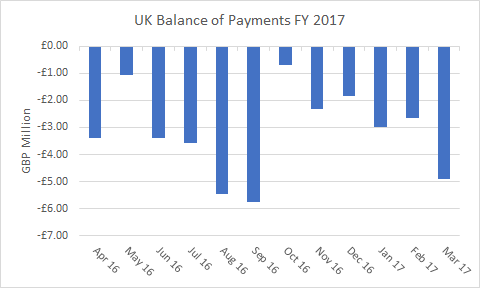 This chart would also benefit from an illustration of the FX rate and the note that the UK voted to leave the EU and gave notice on the intention to quit in March, too late to impact any FY 17 figures.